CAP is a special award for cumulative scores in 4 different categories, and Jenny placed 6th. Special thanks to the sponsors who put it all together--Paul, Rachel Doutrich, and Regina Ruckert--and to the children for doing us proud. 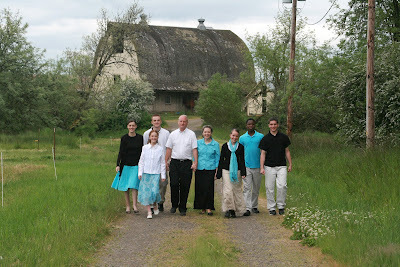 Some time ago we had a family picture taken with Paul's Grandpa Orval's old barn in the background. This photo is on the cover of my new book and also on the living room wall. Something very odd keeps happening. People say, "That is really a nice picture of that old barn." "Oh. Sorry. It's a nice shot of your family too. But that is just a really neat old barn." Yesterday was a Smucker lunch at the fellowship hall at church, complete with locals and the folks from John Day and Cousin Brian and his lively wife Twila and their even-livelier flock of daughters from Idaho, and also Paul's aunts Nadine and Allene, who among many other virtues tell great stories. I believe it was Twila who commented about the nice shot of Grandpa's old barn. Which led to a story about Aunt Wilma. "Wilma wasn't afraid of anything. Not a thing. She'd pick up snakes and chase us. She thought that was so funny. And when Dad built that barn, Wilma climbed up to the very peak of the roof and reached underneath and painted that part up underneath there, under the roof." The soffit, I think she meant. Just imagining it made me go weak in my legs. "What, did she straddle the peak and lean down?" I said. "No, she kind of lay down up there and reached around. She wasn't afraid of anything." It's nice that feminism came along some 20 years later and freed Aunt Wilma from male oppression forcing her into stereotyped gender roles. That cynical statement is born out of supporting Emily through a literature(!?) class this last term in which the teacher and all the other students assumed without question that in the vague "past," all married women were equally oppressed by their husbands, all black people in this country were equally downtrodden, all religious folks were equally deluded, and all women were equally forced into specific gender roles. She also took a journalism class this term in which she was told you never make blanket statements or assumptions in your writing and you have to be able to verify, chapter and verse, every statement you make and every fact you present. She decided she definitely prefers journalism to literature. The aunts also told about the engaged couple who met at Walmart. "Yes! They met at Walmart! He prayed before he went. It never occurred to me to pray before I go to Walmart, that I'll meet someone, but I guess I should!" Finally we pieced the story together, between two emphatic aunts injecting random bits of information. She turns out to be Uncle James's children's aunt who has been widowed for a number of years. She was just going to Walmart on a normal shopping trip. She certainly didn't pray about a new husband before she left. He was "Ralph Yoder's" brother, so we all know he comes from Mennonite stock but SHE had no way of knowing that when she kept running into him at Walmart that day. And she also didn't know that his wife had died a year ago. Or that before he left the house that day he prayed he'd meet someone. They kept meeting up in the store in one aisle after another, and finally at about the third meeting she said, "Do I know you??" and they started talking. And we will see if the Aunts decide to pray before they go to Walmart next time. As a certain Smucker wife exclaimed, "I'll have to keep that in mind for if 'Nathan' ever dies!" I am sorry if I hurt you with that recent post about fashion. Some people took it as making fun of fat people. Of course I didn't mean to hurt anyone but most of the time I do a lot of damage before I have a clue of it, and I always have more to learn about how words come across. Here are some of my thoughts, in hindsight. 1. Weight is a very volatile subject. Much more so than other human-body issues, such as gray hair, neck wrinkles, chin hairs, even tattooing and vaccinations. Offenses flare up quicker with weight than anything else, I think. 2. I may not be obese but I weigh more than I want to and I know about struggles with weight and how it's like holding a big beach ball underwater: hard continual effort and if you let go for a second it bobs right back up to where it was before. 3. A certain overweight person was heard to say, "It's who I am, and I can't help it." I'm sure all of us who would like to lose a few (or more) pounds would like to think we can't help it. "I've had babies, it's the Prednisone for my asthma, I'm 50 years old, it's my thyroid." However. If we all went on the Haiti diet, and had a mango for breakfast and then walked a mile and fetched a 5-gallon jug of water home on our heads and then ate a little bit of corn mush that we cooked over the fire and then hoed the garden all afternoon, we would all lose weight, Prednisone or not. So let's not kid ourselves. 4. We will lose weight when the pain of change is less than the pain of staying the same. What keeps me from losing weight is that I don't like to think about food. I like to toss something in my mouth when I'm hungry. Losing weight will require a mindfulness that I haven't been willing to expend. 5. The attitude of my fine Amish forebears seemed to be that weight wasn't a big deal as long as you could work hard and were healthy. It would have been silly for a woman my age and size to obsess about getting skinny. However, it was NOT ok to be "mocklich fett" i.e. so "fett" that you could hardly get out of a chair. Because then you could hardly work, either. 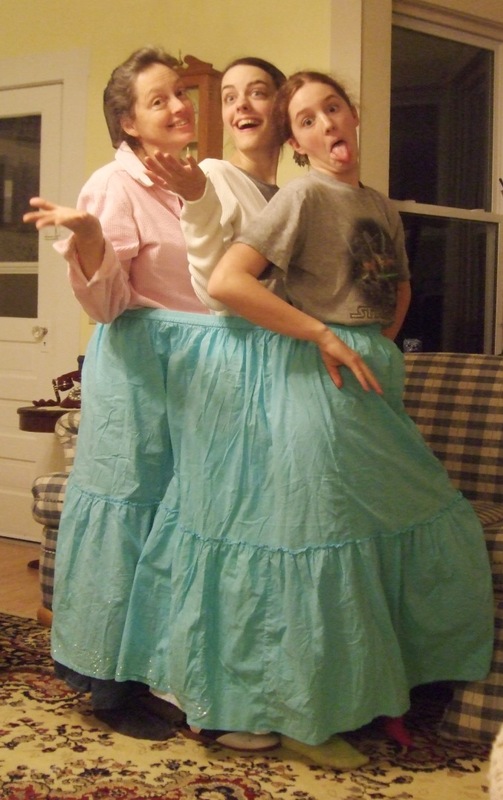 I pulled this picture of Amish people from Katie Troyer's Facebook. She also has a wonderful photo-blog called Project 365. I'm intrigued with Mrs. Green Dress there in the middle. She is not model skinny but if she is anything like the Amish ladies I have known I really doubt it bothers her. And look at those arms. She looks like she could do a hard day's work by lunchtime and throw a full meal together for supper for unexpected company and if the situation required could probably smack a mouthy teenager into the middle of next week as well. As for Mr. Lighter-Green Shirt a little to the left, I don't think you want to give him any trouble either, despite the gray in his beard and the slight paunch. Oh wait. Never mind. 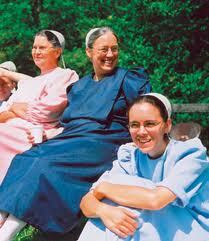 The Amish are Gentle People who would only be Kind and Loving to Everyone. Sorry, I forgot. Oh yes, as I was saying--maybe we could learn from the Amish here, that it ought to be about being healthy and hard-working rather than achieving a certain Look. 6. If I offend you on the Shoe, please send me a note and say, "I know you didn't mean to but this ("_______") hurt me because ______. If you would say it like this "_________" instead, it would not sound as bad." I would like to know, and I won't know if you don't tell me. 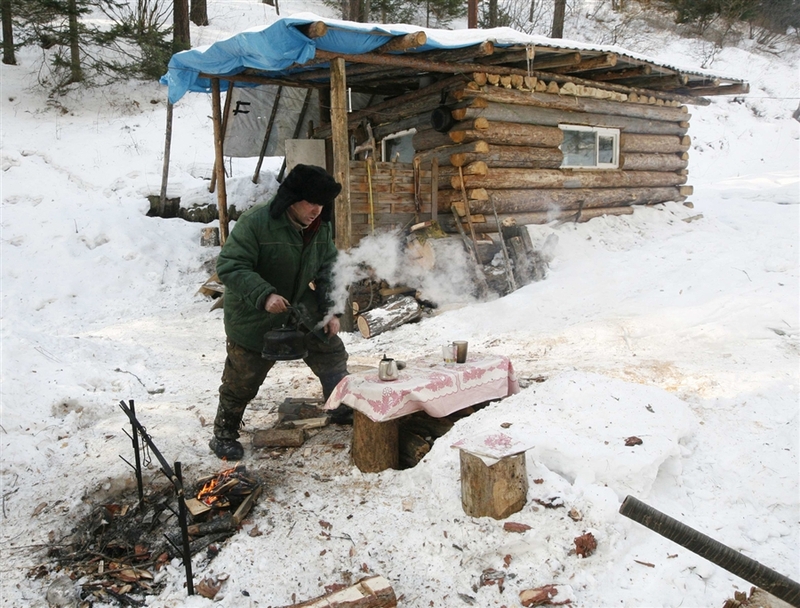 Meanwhile, on to more cheerful subjects, like this guy who lives in Siberia and makes these creative machines to drive on snow. And who takes breaks to make tea. 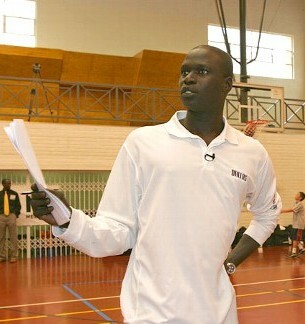 I don't read many basketball stories online, but my observant son Ben sent me this link, about a basketball player from Cameroon, and Ben told me to note the date and time when this young man came to America from Africa. Close to midnight, Christmas Eve, 2004. The same day and almost the exact time that Steven was arriving from Kenya. Jenny: Mom, tell Steven to stop making fun of me! Steven: I'm not making fun of you. I'm just, you know, LAUGHING. Do you ever try to analyze why you wear what you do? In my Beachy-Amish younger days I was taught that following the fads and fashions of the world was a very bad thing, and so we had a very specific, prescribed style of dress that we wore which was simple, modest and economical and most definitely did not follow the fads and fashions of the world. Except it sort of did, what with polyester doubleknit when that was about the only fabric you could buy, and all the little details we tried to get away with when those were "in" in worldly garments. 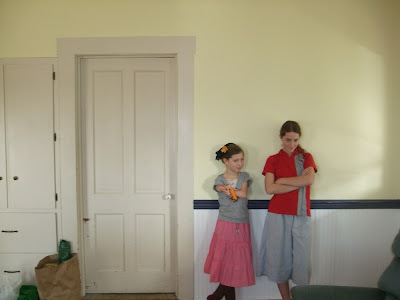 Which meant that the church fathers' purposes were kind of defeated, because if you got a grocery sack full of hand-me-down dresses, it was OBVIOUS which ones were from ten years ago, even if they were all solid colored, with capes, and you didn't wear them unless you were desperate. So I wore the dresses the church prescribed with whatever embellishments I had the patience to sew, that I thought I could get by with. Today I am in an admittedly-boring groove with clothes. I wear Mennonite clothes--long skirts and high necklines but not solid-color capes. Mostly I wear what I do because it's affordable, durable, warm, reasonably pretty, appropriate for the occasion, and of classic style to wear until it wears out. And did I mention warm? Warm is important. I wear a lot of long denim skirts, long khaki skirts, long-sleeved t-shirts from Lands End, and corduroy jackets from Christopher and Banks. Or sweaters. 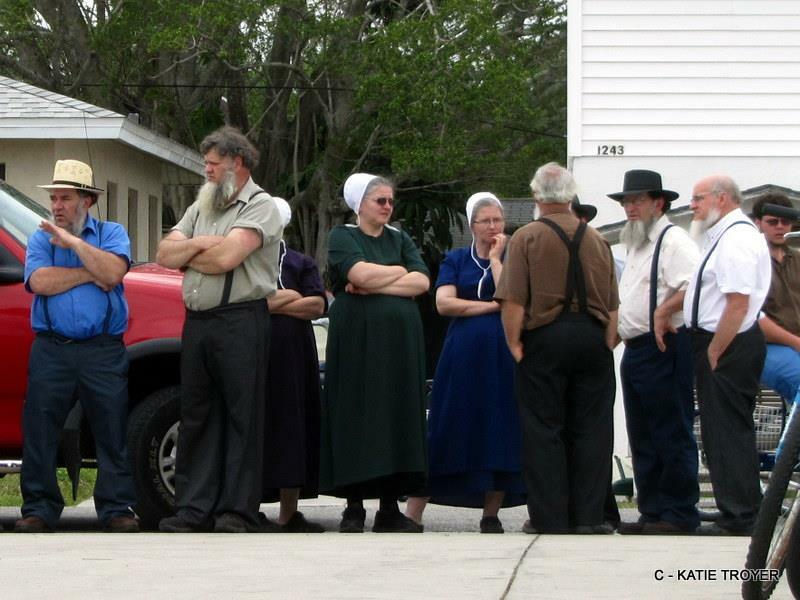 These days, the Beachy-Amish are more fashionable than me. I am just trying to stay warm. I am not following the fads and fashions of this world, I don't believe. We plan to go to Thailand again this summer. The dress code at the Bible school there is one-piece dresses or jumpers. And the climate is HOT. 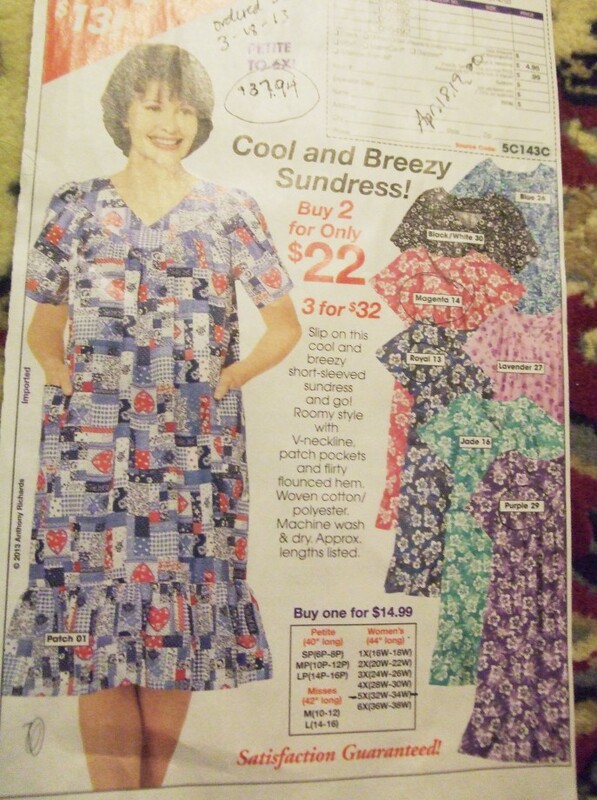 Which means I need cool, loose, cotton dresses. Which I don't have. Which means I have to think and plan about clothes. Which I don't enjoy. There's a lady in my life that I feel somewhat responsible for, and she also needs dresses. In the Sunday paper there was an ad for inexpensive dresses. So I ordered three. And I realized two things. One is that I have a prejudice against large sizes. I ordered the dresses in size 5X and felt compelled to explain to the guy on the phone that these were not for me. Wow. Like it mattered. The other is that I am more fashion-conscious than I knew. I took a good look at the ad. What was keeping me from ordering these dresses for me to wear in Thailand? They were loose and cottony and long enough. The sleeves were long enough. I could easily bring the neck up to code. I liked the purple print. They were economical and it would be good stewardship to buy a few and forget about sewing. They would be nice and breezy in that awful heat. BUT NO WAY WAS I GOING TO BUY THOSE DRESSES FOR MYSELF. I asked myself why. Why in the world did it matter, what with starving children in the world and all that? Not unless I lived entirely among blind people. I asked my girls what they thought. Emily: "Oh my. Those are dresses? Not housecoats or hospital gowns? I mean, if you wore a wide cinchy belt and a cute cardigan MAYBE you could make a dress like this presentable IF you could find an ok print." "What sort of person does it make you think of?" I said. Emily: [something negative-stereotyped about the sort of horizontally challenged people who do not take care of themselves hygienically and whose feet go slap slap slap when they walk]"And bad breath." Jenny: "Someone who's going to bed." There have been many garments--such as denim jeans--that made the transition from practical and ugly to the height of fashion. How would we all react if the skinny young moms of this land would all start wearing these dresses? And posting Instagram shots of themselves wearing them with cute sandals and sunglasses? Like Shelley the niece over at Frame of Mind. We would all think, "Oh, ok. I guess I was all mixed up. They ARE pretty, really, kind of." So, are we all slaves to fashion? Or are clothes actually more like costumes, telling people who we are and what we do and how we feel about ourselves and our place in society? In which case it behooves us to be careful what we wear. I'd love to hear from you: why do you wear what you wear, REALLY? I bought a pretty, cottony skirt at Goodwill that was very large so it had enough fabric to turn it into a Thailand-dress for Jenny or me. Some brilliant Smucker mind had an idea and this is what resulted. It's too bad Amy wasn't here. There was room for her, too. Did you know you cannot copyright a recipe? My friend Carol the copyright lawyer told me that. There was a legal battle over this at some point, of course, and the conclusion was that a recipe is essentially a list rather than a true written work. So you can't claim ownership of it. I am guessing this decision was made back in the day when a recipe was just a recipe. For food. To eat. Today, the most popular recipe-sharing forum is the Internet, and I use it often. But you can't just share a recipe there, like--Oh, hey, here's a recipe for muffins you might like. Help yourself. No, no. You have to out-talk, out-do, out-clever, and out-cute every other recipe writer out there. Wow! This cheesy garlic bread could make any dinner memorable. Just imagine dipping these little pull-aparts into a warm bowl of marinara! I’m drooling. They would be a heavenly alternative to traditional bread rolls, especially over the holidays when we want to impress our dinner guests! For the recipe and baking instructions, hop on over to Thirty Handmade Days where Mique will show you how! Now everyone can enjoy a fresh batch of homemade yeast rolls. I promise. Not only are these yeast rolls but they are covered in butter, garlic and cheese. Who could resist!? Yeah, butter, garlic, cheese and fresh baked rolls. Heaven. Today I’ve got step by step instructions on how to create the most amazing, garlicy, cheesy, gooey yeast rolls you could ask for. Step Six: Allow to sit at room temperature and rise until double – about 1 1/2 hours. It is now ready to bake!! You will want to either place a cookie sheet under it or line the bottom of the pan with foil as the butter may leak out from the spring form pan while baking and make a big mess in the bottom of your oven, causing your smoke detector to go off and your alarm company to call and see if your house is on fire! Then it comes out of your oven looking like this! And all this is for a bread that's not even made from scratch but from PURCHASED FROZEN DOUGH. I'm supposed to grab a piece?? And eat it?? And enjoy it?? I am so glad you told me that. I was going to just admire it and then give it to the cats after it dried out on the counter. Ok, folks, I know some of you think butchering the children's pet pig is distasteful but you just send the kidlets down to the creek to fish all morning [scroll down through 14 dreamy photos of Gap-denim-clad blond-bowl-cut kids by a sun-dappled creek] and then kiss your big strong hubby [shot of rough masculine hands] and tell him the butchering is HIS job, and then YOU show up when the galvanized wash tub of ground pork shows up in the summer kitchen. I hope you got all the casings ready yesterday because seriously, peeps, you don't want to leave that tub sitting overnight and it won't fit in the icebox, believe me. And I hope you got some extra sage and ginger and pepper from the grocer [shot of little cute labeled glass spice jars] because you'll need a bunch of it. So, get your calico apron on and flex that spoon-arm and let's get this done!! The writer of the cheesy garlic bread recipe is probably going to accuse me of copyright violations for copying her recipe here and if she does I will go find my friend Carol. Who will probably tell me that, sorry, recipes are now in the same category as novels and essays because not even lawyers could convince anyone that a recipe on the internet is only a list. Me: Did you read about that lady out at Yachats that drove her car off the cliff into the ocean? Steven: Was her last name Lemming? Not as a patient. Paul's mom had the flu and it turned to pneumonia, so she's in here trying to get well. Meanwhile, her family has been staying with her, one or two at a time as per ICU rules. Tonight it's my turn. I plan to spend the night. One's thoughts go in strange directions at such times. You know all those babies you had, and got up nights with, and thought would never grow up? And you wondered if your investment would ever pay off? Well, it pays off, just so you know, in a stream of tall, grown sons and daughters who come and go and do not leave you alone in the hospital when you are 79. If all the other benefits of grown children were not considered, this in itself would be worth it, I think. The ICU staff seem just a bit overwhelmed with Smuckers. "We put her on the machine earlier when John was here," the nurse told me. "Or wait, maybe it was Paul. Or Steve? Is there a Steve?" Yes. And Lois and Rosie. And everyone's spouses. And two more siblings arriving this weekend. And the grandchildren haven't even been here. If Anne gets moved to a regular room, we'll descend in such swarms as the nurses have probably never beheld. Hospitals and airports have the same sort of feel at night, with too much light and far-off voices and lots of screens with information and readouts that may or may not make sense, which can bode hope or terrible things, and you feel very out of control. The human body produces lots of fluids. You don't think about this so much on a daily basis, when you and the people around you have all their fluids under control. But medical people get to deal with lots of body fluids and other products--suctioning horrible stuff out of lungs, for instance. My sister the nurse says this doesn't bother her. My SIL the medical assistant says she does this daily. They are brave women. But hey, I help Anne suction her mouth when she coughs--let courage rise with danger, and strength to strength oppose. But afterwards I don't drink tea for a while. Why is it called a "sinus" heartbeat? Very odd. It has nothing to do with nasal cavities, I'm sure. What a mix of low and high tech this place is. Tubes, monitors, screens, beeping gauges. Rolling machines that probably cost as much as a new car. And a magic-markered sign. "SPEAK INTO LEFT EAR." And now I will try to sleep a little and let angels vigil keep. A long time ago I posted about the bare wall in the living room and asked you for ideas for what to put on it. You all gave me lots of ideas, which I appreciated very much. After months of dithering and indecision, and of forgetting about it because I had a lot of other things on my mind, it finally got done. I ought to let you know how it turned out, right? The picture is one that Ruth from Swartzendruber Photography took of our family before we all scattered to the winds, printed on canvas, from CafePress. 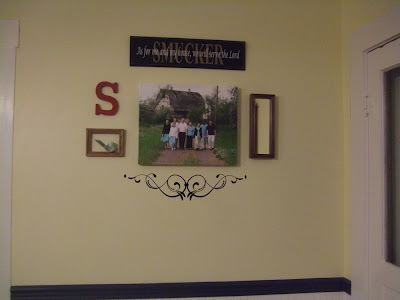 The "Smucker" plaque is from my sister-in-law Bonnie. I think I got the mirror on the right from Bonnie's garage sale, a long time ago. 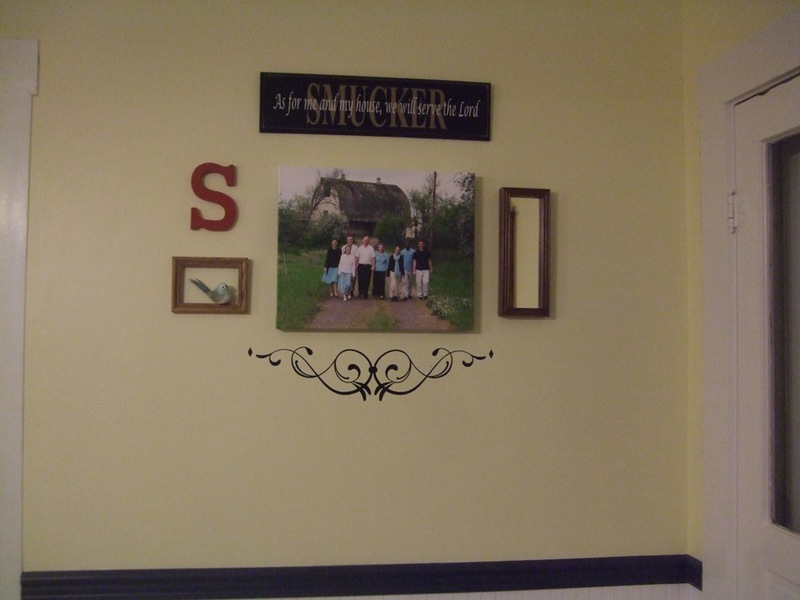 The scrolly thing down below is pretty wall-wordy, so as you can see, even I succumbed. 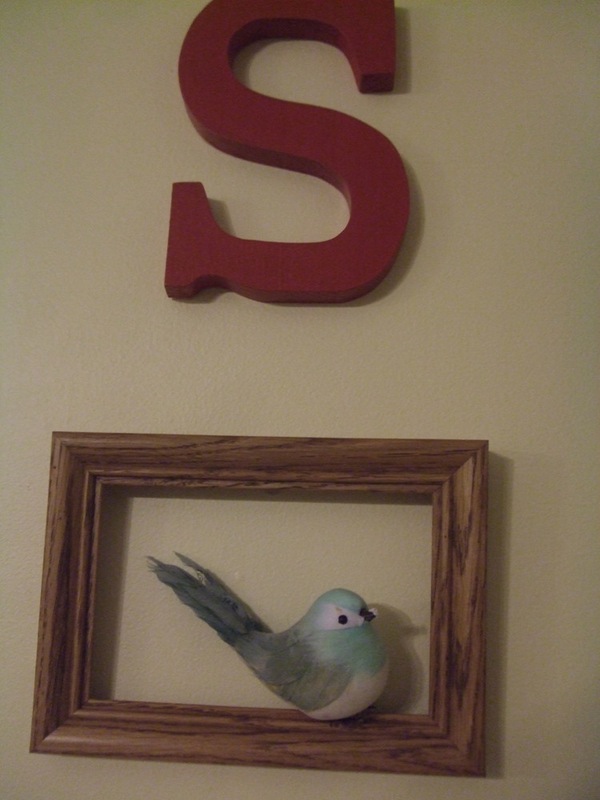 The S was 25 cents at the Etcetera shop in Lebanon. Jenny painted it for me. Emily: Yes. But in a good way. Naturally, the yellow teapot's arrival made its way into my Register-Guard column for March. Jenny has been home sick with a fever for two days, which means she watches videos a lot. Yesterday I walked in in the middle of "Cranford," that wonderful Elizabeth Gaskell story. Captain Brown had just carved a wooden coal scoop for...their names escape me....those two lovable elderly sisters. The older one looks at the coal scoop and says, soberly, "Captain Brown, this is highly individual." Some things in my life are highly individual as well. The other day I was getting groceries. Over by the milk, this mom came along, pushing her cart, with her maybe 11-year-old twin daughters, one on each side of her. They looked cute and well-cared-for and like they were having fun. As they passed, I looked again. Each girl was missing a leg below the knee. One was missing the right leg and the other, the left. A "highly individual" sight, believe me. My first thought was that they were messing with our minds and playing a good joke. Maybe they has pushed both legs down one pant leg. But no, their jeans were tight enough that that would be impossible. I wanted very badly to stare and to ask them about 50 questions. I decided instead to let them shop in peace. But I wonder. Were they conjoined twins, attached at the knee? Were they in a freak accident? Or were they mirror twins with the same birth defect? I hope I have a chance to talk with them someday when I'm not imposing. The second "highly individual" item is Emily's writing assignment. She is finding that some classes, especially Communications classes, encourage writing and expression in the most concise, clear manner possible. These teachers make sure that the assignments are clearly explained and the students write clearly in response. Then there's her literature class, in which obscurity seems to be encouraged and vague is good and all kinds of modern political ants swarm all over the literary material. Emily brought me a paper the other morning and said, "Can you help me figure out what this teacher wants from us?" Packer: We've arrived at a point in the African American literary tradition where the literary artist is not burdened by the socio-political drive of "racial uplift" that we've seen throughout the writers we've studied (art as social protest, art as a declaration: we are human, we are worthy). If you agree, then explain in what ways is Packer continues to take part in the African American literary tradition? With what themes? With what techniques? It really said, ". . . in what ways is Packer continues. . ."
Then there's that "if you agree." With no guidance for anyone who disagrees. It was highly individual, I thought. I told Emily to concoct something wordy and obscure from her rich imagination and throw in some mysterious, obtuse phrases and she will do fine. The third item is just a bit of fun trivia. The new governor of Washington State is Jay Inslee. I had dinner with him once. He wasn’t the governor then. He was a representative to either the state or national legislature, and he had written a book. So he was one of 50 featured authors at a Pacific Northwest Booksellers Association event in Seattle. We sat at the same table for dinner and had a nice chat. I was impressed with his normal-ness and his friendliness and his story of how he and his wife got involved in politics. They were concerned with things in the local schools and gradually realized that if they were on the school board, they could actually do something about it. And now, many years later, he's governor. He and his wife have been married since 1972, and he told us how hard it is to combine politics and family life, and he couldn't possibly do what he does without his wife being such an amazing supporter. Also at our table that evening was the actress Meg Tilly. In contrast to Mr. Inslee, Ms. Tilly had had too much to drink and was laughing way too much and took no interest in the likes of me. Later I found out she had had a child fathered by Colin Firth. Yes, the beloved heartthrob, Mr. Darcy in the old Pride and Prejudice movie. That is just wrong on many levels. I seldom actually think about this, but it is a highly individual sensation to know that I had dinner with the governor of Washington and someone who had an affair with Mr. Darcy. We were looking for a desk for Jenny on Craigslist and saw a picture of an old school desk, the kind where the part where you write on is attached to the seat in front of you. Me: Hey we used to have those! Jenny: Did you dip each other’s hair in the inkwell? Me: We had our hair up, with coverings on. Jenny: Did you dip each other’s covering strings in the inkwell?